As I mentioned last winter, we took this year off from farming. Kind of. We didn’t have our own farm, that much is true. One big lesson we learned from two years of farming at New Entry in Dracut is that living 40 miles away from your farm is TOO far. In 2013, the cost of driving for farm work was more than $4,000. And the time and energy it took was not small, either. So one big complication for our farming future is that we live in the city, in Brookline (right next to Boston), and because of Tracy’s job and school for our son, we’re likely to be here for a while. And also because of my work as a playwright, too–right now I’m in a super busy stretch of new play productions, and it’s really helpful to be close to work so I can get to and from rehearsals (by bike, usually). Where we live is especially densely populated (we don’t even have a yard) and expensive, so it’s very, very hard to find even a small amount of farmland that we can lease or buy. And farming without land is really tough (not impossible, I know, but the kind of farming that I like to do requires land). As my writing career gets busier, it’s also a lot trickier to figure out how to squeeze in the business of running my own farm. One of the other lessons from 2012 and 2013 is that farming isn’t just a tough physical undertaking, it’s also a completely engrossing activity, mentally. While the season is in progress, if you have your own farm, you are fully absorbed with planning and executing plans and responding to emergencies. I LOVED it, but I know that diving that deep requires the time and space to make it happen. So I miss having my own farm, a lot, but I accept that I can’t necessarily do everything I want, all at once. On the plus side, this season, I was able to get some farm time on the farm of a friend. Laura Davis, a friend from New Entry, hired me to work on her Long Life Farm in Upton, MA, one day a week. It was a true joy to get to hang out with her and her husband Don and the other crew members and get my hands dirty. 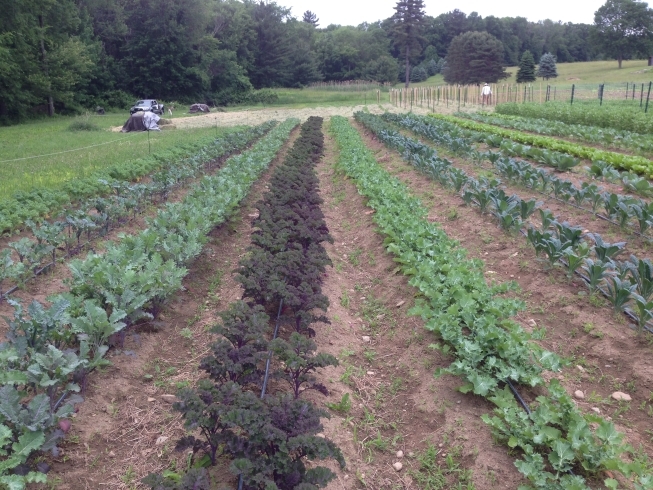 They farm a couple acres of organic vegetables, which meshed perfectly with my experience and my interests. And I got paid in both cash and vegetables, while getting to spend time outdoors, practice my farm skills, and keep learning more and more about growing food. Though the commute was long, I was only there one day a week. And, more importantly, the farm work didn’t intrude into the rest of my life and take over every waking thought. I could work hard, come home tired and sore, and get back to work on my newest play script. Don, Michelle, and Laura at Long Life Farm. Indeed, I found that working that one day a week was a perfect antidote to sitting staring at a computer at my desk all day, or sending out dozens of e-mails. That one day a week working with my hands, on the land, made me feel much more grounded and sane. Over the past month or so, I’ve had a three-part blog series running on the HowlRound web site: What Farming is Teaching/Reminding Me about Playwriting and Theater. It sums up a lot of what I’ve learned from the past two years of farming. 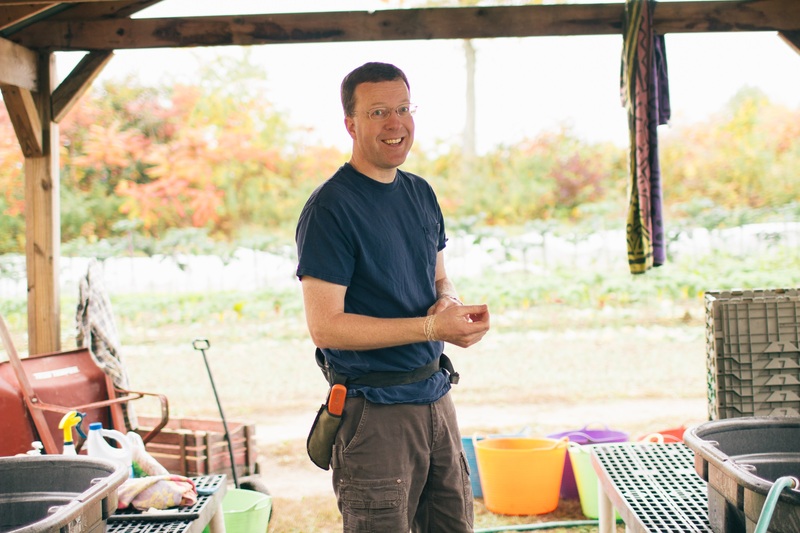 This year, I’m taking a year off from farming–our fields were too far from home, so I need to find a site a lot closer to Brookline (which is a big challenge), and I need to devote some more time to writing and family. But I will definitely do more farming, somehow, somewhere, in my double-life as a writer/farmer. I still need to find some time to finish up the crop reports on this blog. I hope they’re useful to new micro-farmers, but for me, they’re an important way to document what I’ve learned, so I don’t have to repeat the same lessons over again when I get back in the field. I’ve been a little distracted by my writing life lately, but I’m back to try to make some progress on the crop report, a few veggies at a time. Sales: $224. Projected: $216. We were getting $2/bunch, well above our projected price of $1.50/bunch. Amount sold: 114 bunches Projected: 160 bunches. What was good about it? Cilantro is always a good seller at the market, and its fragrance is a nice attractor for customers. We could easily sell 5-10 bunches every market day (once we sold 14). What we grew was of very high quality. Last year, I cut and bunched it, and I started doing that this year. But I learned that it’s much better to pull out the plants by the roots and sell them whole because it stays fresher at the market that way, and it’s faster to pick that way, and each succession is really only good for 3 weeks, before it starts to bolt. Picking it all by the roots really forces you to do the succession work and not try to eke out another cutting. Keeping it well-weeded early is critical for plant health and for ease of harvest. I direct seeded it heavily in two rows per bed. Thinning produced the first harvest, and then I could pick every other plant for 2-3 weeks, before the bed was empty. What could have been better? Our first succession was overwhelmed by weeds and standing water from the bad weather. And I was clipping it rather than pulling it. Cilantro really prefers loose, well drained soil. Raised beds helped us get that for the later season plantings. Would I grow it again? Oh, yes. I just love this stuff. It’s fun to grow and customers like it and I think we finally figured out a good way to grow it. Amount grown: 2 successions. Spring succession of about 40 feet all died due to standing water. Fall succession was about 50 feet. Sales: $125 Projected $192. We were getting $3/bunch, versus our projected price of $2. What was good about it? The fall succession was AMAZING. We grew it in double rows, spaced about 12 inches between plants, from transplants started under lights in our basement. We grew the plants under row cover, and they got to be HUGE. Amazingly tender. Very little pest problems for the late season crop, though we did spray bT against white cabbage butterflies (they were doing major damage). This was the first time I felt like I’ve gotten collards right. I even sold 11 bunches at the market in one day, which was a shocker, because not everyone is used to cooking them. But they were just so beautiful. What could have been better? We lost the entire early season crop due to weather and weeds. I should have given up on it sooner and started over. Standing water just killed us. I’m not sure it’s worth doing a spring crop of collards anyway. In our climate, it’s probably best to just leave it for the fall. 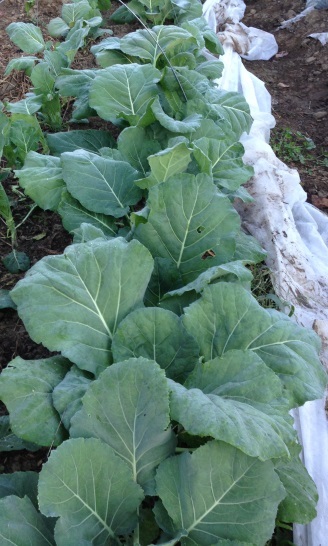 All our collards were sold in October. Would I grow it again? Yes. In the fall, doing an August transplanting of seeds started indoors in July, for an October crop. Raised beds can be helpful. What was good about it? When we had them, they sold very well. The plants looked great before disease took them out. What could have been better? Wow, these really tanked for us this year. I thought that by getting a late planting, we’d avoid striped cucumber beetles. And we did, but we ended up having fungal problems that took out the entire crop, just as it was really getting going. We didn’t get a single lemon cucumber. The fungal problems were a function of our very wet late spring and very hot early summer. Cucumbers are a crop that I’m far from mastering. I need to try more successions, and hope to have one of them hit for us. But on a small farm hampered by early wet soil conditions, that was pretty much impossible. Would I grow it again? Maybe. I love eating them and selling them, and customers like them. But pests and disease have made them very hard to grow. I’d keep trying, but I wouldn’t count on making a lot of money from them. Amount grown: 20 ft Cosmos, 20 ft Zinnias, 20 ft Calendula, two succesions of Sunflowers, each about 100 feet. Sales: $67 cut flowers (non-sunflower), $209 sunflowers. Projected: $196 cut flowers, $345 sunflowers. We got a lower price than projected for bouquets ($3-$4 vs $4) and for sunflowers ($1/each versus $4 for 3 flower bunches). Amount sold: 21 bunches cut flowers, 209 sunflowers. Projected: 52 bouquets of cut flowers, 270 sunflowers. What was good about it? They were so pretty in the field, and they attracted customers. The sunflowers were absolutely gorgeous, and the single-stem hybrids really are designed to be cut and sold. I loved having them at the market. The cut sunflowers lasted a very long time, at least a week. Customers really liked them. What could have been better? Our cut flowers suffered a lot from standing water in the field early in the season–this lead to stunted plants and a very delayed harvest. The zinnias and calendula produced almost nothing for us. I also didn’t like any of the varieties that we had for cut flowers, in terms of coloration. Next time I’d choose pink cosmos–white don’t draw enough attention at the market (we had some pink and reds in there by accident, but they were mostly white). More single colors and brighter colors. I also am not fast enough at cutting the flowers to make it an efficient crop. The sunflowers seeds were expensive ($58), and I’d like to try to find a cheaper source. I also had two main successions, which turned out to a big mistake, because they’re so well-hybridized that each succession ALL BLOOMED AT ONCE. Which gave me lots of sunflowers, but what I needed was to have smaller successions planted every week, so that I could have some at every market, instead of bringing 100 flowers on a single day. They also didn’t sell quite as well as I expected (I didn’t count on having any leftover). On the other hand, having leftover sunflowers is not a bad thing, because we love having them in the house. Would I grow it again? Yes. I’d try cut flowers again, but maybe different types of flowers. Choosing ones that are fast to pick and bunch is very important. And I’d definitely do sunflowers, but in smaller successions, so that I could have them more steadily over the summer. They were very good attractors and brightened the whole market. Next up: garlic, husk cherries, kale, lavender. Amount grown: Spring succession: 50 ft Early Wonder, 50 ft Chiogga, 70 ft Bull’s Blood. Fall succession: 35 ft Early Wonder, 35 ft Chiogga. All direct seeded. Sales: $198 (Early Wonder and Chiogga), $179 Bull’s Blood, $377 total beet sales. Projected: $392. Where sold: Farmer’s market and our mini-CSA. What was good about it? Field conditions were very bad for our early beets, but the Bull’s Blood managed to get through it (the others didn’t). 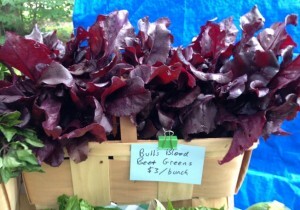 I sold the Bull’s Blood primarily for their greens for most of the season, and they were a steady and popular seller. The fall crop of beets did much better, especially the Chiogga beets, which had good size and quality and beautiful greens. When I had beets at the market, they usually sold pretty well. I was able to harvest multiple cuttings of Bull’s Blood Beet greens, a lot like chard. 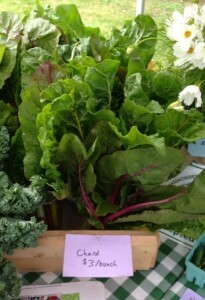 Bull’s Blood beet greens enabled us to come in close to our projected sales. Plus our we got a better price for the greens ($3 versus $2) than expected. I did apply some Boron to try to perk up the first planting, which helped a little (but not enough). What could have been better? Field conditions were very, very bad for our early beets. They had almost no size. Plus we had bad weed pressure (due to early wet conditions). I should have given up earlier on the first planting of beets–if they don’t get off to a good start, it seems like it’s very hard for them to reach a marketable size. They really need well-drained soil and can’t be super wet. Our second planting was in a raised bed and that helped a LOT (as did better weather). The Bull’s Blood were very strong and lasted through most of the season, but their quality declined in the fall. I would have been better off planting a second succession of them in late summer. Would I grow it again? Yes, because customers like them and we got a decent price for them. This is a crop that I want to learn to grow better. I love growing Bull’s Blood–their greens are so beautiful and they’re something most customers have never tried before (and enjoy). Next time, I would grow only Early Wonder in the spring, and grow Red Ace and Chiogga in the fall. And Bull’s Blood all season. I find that I have to sow the seed pretty heavily to get good germination (and then thin), so I’ll make sure to order more seeds next time. What was good about it? Not much. Well, I guess it sprouted pretty well in our transplant trays and we had very strong seedlings. And the flavor for what we harvested was very good. What could have been better? This was a terrible crop for us this year. The spring crop suffered from very bad field conditions and bad weather. Too much water, standing water, weed pressure, then a severe heat wave in early July hurt yield a lot. This is a crop that I should have given up on sooner. Our fall crop was planted in mid-August and grew to be huge plants, but gave NO harvestable heads. Huge disappointment. I guess next time, I’ll have to get it started a couple weeks earlier. Would I grow it again? Maybe as a learning exercise, but I still am a long way from mastering it for production. I would definitely NOT grow De Cicco again–the heads are too small. Broccoli seems like a lot of work and field space for a crop with a fairly limited yield. I also had a very hard time finding organic seeds in the varieties that I want. However, my family loves to eat broccoli (as do our customers), so I’d like to figure this one out someday. What was good about it? The carrots were pretty tasty and of a decent size. Customers liked them and we almost always sold out. What could have been better? Poor field conditions and bad weather led to a very late harvest. I’d planned on a late spring/early summer crop, but instead was harvesting in September. I should have ordered a lot more seeds–they need to be seeded pretty heavily. 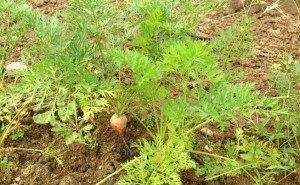 The timing for weeding carrots is a bit of an art, and I felt like a real duffer. We suffered from heavy weed pressure, due to our super rainy June and July. Would I grow it again? I’d try. I like eating carrots and apparently so do my customers. And they provide nice variety on the farm stand. 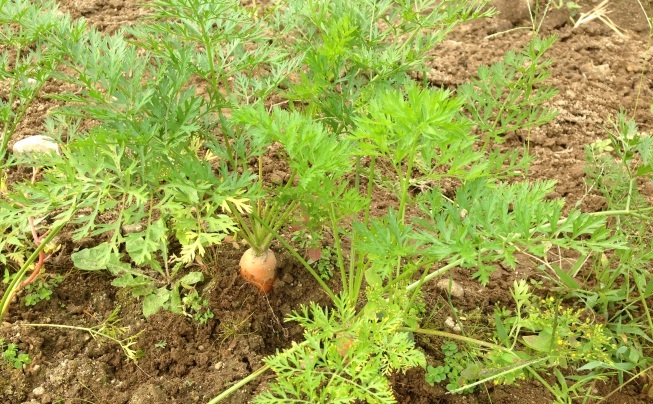 However, it’s critical to make sure that you have the right soil if you’re going to grow carrots–we suffered from compaction about 8 inches down, which was not good for our carrots. A raised bed would have helped somewhat. I like Ya Ya–they’re pretty sturdy, and I like a beefy carrot. Amount grown: 340 feet (2 separate beds, each with a double row). Some were transplants and some was direct seeded. I even purchased some seedlings. Generally, I think direct seeding of chard and work out pretty well, especially if they’re under cover. What was good about it? Later in the season we had good size on the leaves. The bunches we were able to harvest looked good. I’m a fan of the rainbow mix. What could have been better? We came in below projections for both sales and quantity, and sales were actually boosted by us getting more than our expected price at the farmer’s market ($3/bunch vs. $2/bunch). 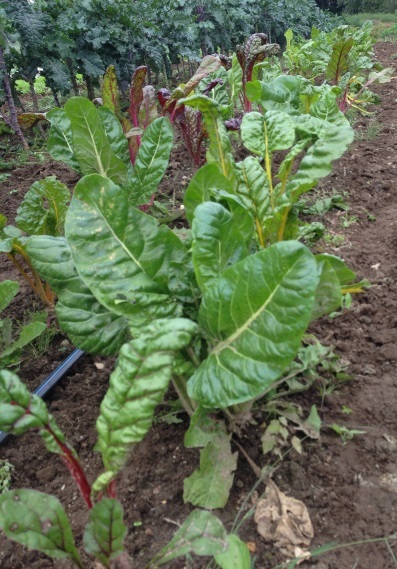 Usually, I find chard super easy to grow, but we struggled a lot with it this season. Again, weather and water were the big problems. Those problems led to some fungal disease that great reduced our yields. The two beds I planted should have been more than enough to meet all our World Peas orders, but I came up short many times, because I had to cull so many diseased leaves. Would I grow it again? Yes. I like growing it, and it’s a steady seller. When we have better weather and soil conditions, it’s pretty easy to grow. Plus, I’m able to harvest the plants all season long, which is a big help. Clearly crop rotation is important to help avoid disease, and I’d be more careful next time. That’s it for today. Next time I’ll have results for Cilantro, Collards, Cucumbers, and flowers. 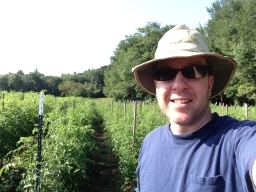 Okay, micro farm geeks (and Pen and Pepper fans), I’ve finally got some time to write up the crop report for the year. We grew a ton of different vegetables, so I’m going to split this up into a few installments. For me, it’s fun (and useful) to think about what we grew and how it turned out and what I’d do differently next time. I hope that it might also be helpful to other new, micro farmers in assessing yields and varieties. It is very hard to find yield data for very small scale farmers. Varieties: Red and green. We didn’t plan to grow this, but Karen, one of the other incubator farmers gave me some extra seedlings. 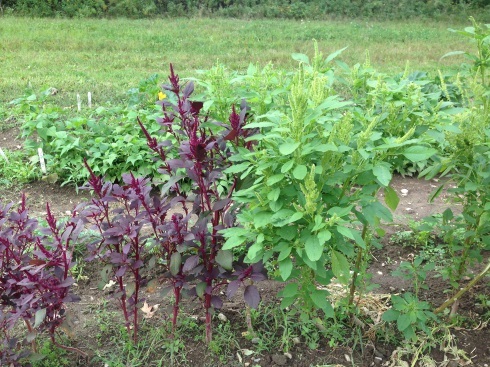 We sold the bags of the greens a couple times and also harvested the tops of the red amaranth to sell as cut flowers. Amount grown: About 12 feet, about a dozen plants. Where sold: Farmer’s market only. Amount sold: 9 bags of leaves. Plus 4-6 bouquets of red amaranth blooms. What was good about it? It got a good price, about $4/bag. It’s supposed to be very healthy. The flowers are very attractive. It grew very well in a part of the field that suffered from compaction and poor drainage. It was the one green that didn’t mind the heat or bad weather. The mature plants were large and had very few pest problems. What could have been better? I’m not quite sure the best way to harvest and prepare the leaves. Most customers had never heard of it, so it took a lot of hand selling to make the sale at the market. Would I grow it again? Maybe. It was a little hard to sell, but it was easy to grow and did very well in the heat. I think I’d need to do more research on how to harvest it more efficiently and find some good recipes to help sell it. I sure liked the way the mature plants looked in the field–very pretty. Thai basil in the field. Varieties: Genovese and Sweet Thai Basil. Both seeds came from Johnny’s, and the Genovese was pelleted. The pelleted seeds are a little easier to work with. We started all our basil under lights in our basement and transplanted them. Sales: $398 Genovese, $156 Thai Basil ($554 combined). We had projected sales of $1,026 for both combined. Amount sold: 172 bunches Genovese, 52 bunches Thai (124 total). Projected was 535 bunches. What was good about it? The Thai Basil bed did pretty well in the heat and poor soil and lasted through most of the season. When we had basil, we were generally able to sell most of it at the market. World Peas would have taken a lot more from us. The biggest plus was that we had only planned to get $2/bunch at the farmer’s market, and we ended up selling bunches for $3, with little trouble. It’s super fragrant, which helps attract customers. 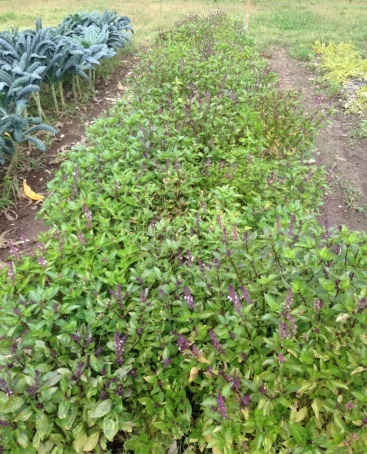 Last year, we grew cinnamon basil, which was a bit too specialized for our market–the Thai basil was a little easier to sell, and still very fragrant. What could have been better? As you can see from the numbers, basil was not a good crop for us this season. It was planted in a part of the field with very poor soil, heavy weed pressure, and very bad drainage. Basil just doesn’t like to have it’s feet soaking wet all the time, so ours really suffered this summer. The later plantings, in a raised bad, were starting to finally do better, but then the entire crop succumbed to Basil Downy Mildew. Would I grow it again? Yes. I like growing basil, and generally it’s easy to grow. I’d be a lot more careful about where I put it–it does not tolerate poorly drained soil. I’d be cautious of counting on huge quantities of it, though, because of Basil Downy Mildew. I’m not quite sure how to get around that problem–it’s an airborne fungus, without a good organic control available. 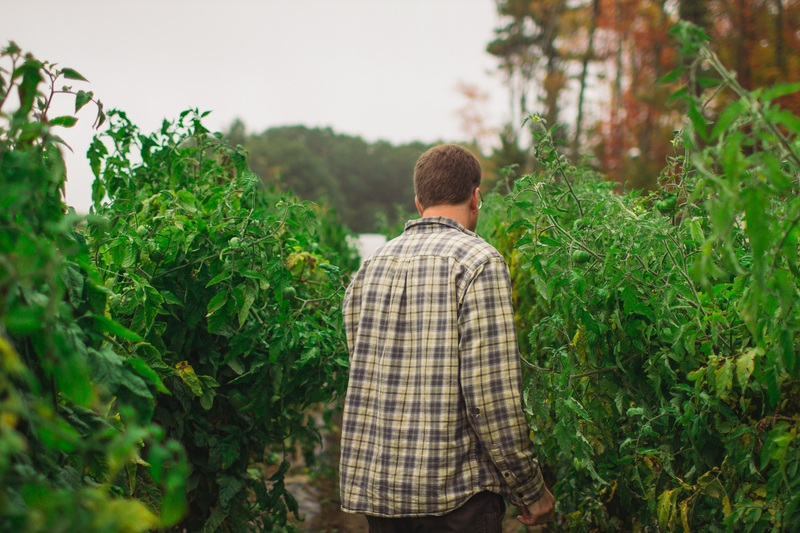 In an incubator setting, like where we were growing, there can be multiple basil crops, and if one farmer gets it, then it can spread quickly (that’s what happened to us). 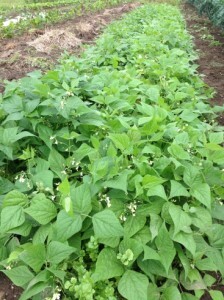 Very happy bean plants, late in the season. Amount grown: 4 successions, each about 30 feet, in a double row (one row of Maxibel, and one of Tavera, side by side). Rows spaced about 12 inches, plants thinned to 2-4 inches, direct seeded at about 1-2 seeds/inch. Amount sold: 60 pounds. Projected about 140 pounds. What was good about it? The quality of of the last two successions, harvested in September and October were very good. The last succession, grown in a raised bed with good drainage, had excellent yield and strong plants. 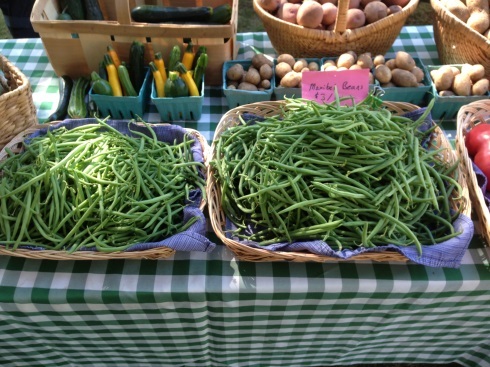 Both are tender, French-cut beans that sold very well at the market. The Maxibels are a little larger and longer and have a better yield. Taveras are a little shorter and can be sold in pint containers, which can raise the price from $3/pound to $4/pound ($2/pint). The Taveras are a little sweeter. The Maxibels successions produced for about 2 weeks each, the Taveras could be picked a little longer. Both sold VERY well when we had them. I don’t think we ever didn’t sell out. What could have been better? Our first succession all died, due to standing water in the field. The second succession struggled in the same field, again from wet soil. The plants grew, but were small and yielded poorly. We only got good beans very late in the season, when the weather and fields dried out enough. Would I grow it again? Yes. I’m personally partial to Tavera, though I can see the benefit of Maxibel. Both sold VERY well, and our customers always wanted more. I think growing a French cut bean is the way to go for a small operation like us, because the quality is high and taste far superior to a standard string bean. Nobody in our family likes picking beans (it’s a tiresome chore), so we not likely to plant more than 30-40 feet at a time. We had soil/field/space issues this season, which really hurt. For us, I think 30-foot successions, every 3 weeks, over the whole season are really the way to go, but it takes good planning to make that work (and some luck). I should have spaced the rows and plants a little wider for better yield. 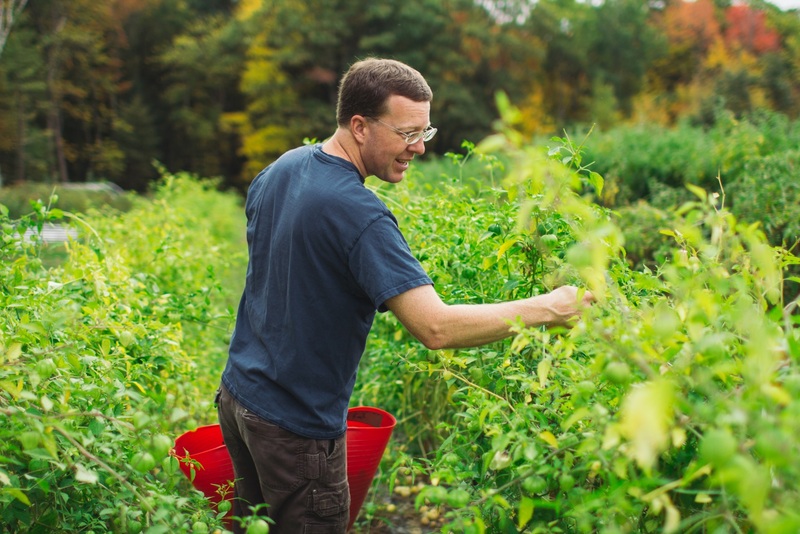 Harvesting tomatillos. Photo by Omar Robinson. Looking at the numbers for the season helps paint a picture of how things really turned out, in a little more detail. I’m going to post a crop-by-crop report soon (but there are 37 crops, so it takes a while to compile). In the meantime, here are the numbers in one big table, side-by-side. You’ll see that almost every crop came up short, either in sales or amount harvested. Only 9 crops generated more sales than expected, plus there were an additional 4 crops that I didn’t plan on growing. So that means 65% of our crops underperformed. Four were complete losses (head lettuce, mint, onions, and lemon cukes). Those numbers highlight the challenging spring we had, weather-wise. In terms of harvest amounts, 7 crops yielded better than expected. 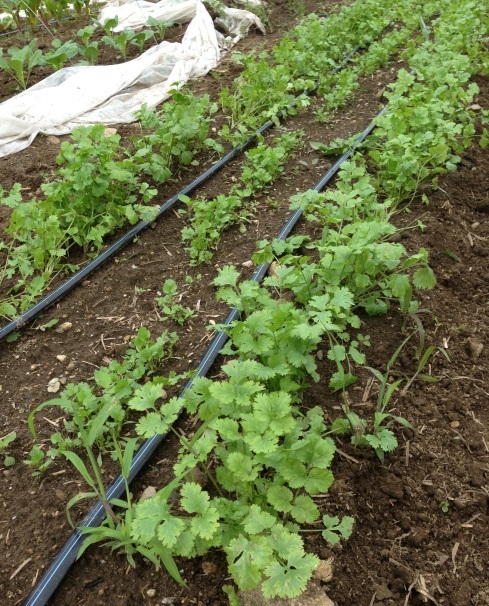 Notice that the crops which performed better in sales are not necessarily the one that did better in yield–this is due to differences in projected prices versus actual prices–cilantro, kale, chard, bagged lettuce, potatoes, tomatillos, and paste tomatoes all sold for more than expected. It’s easy to play the “what if” game with numbers like these, which is sort of what I need to do for future season planning. What if we hadn’t lost all those spring crops? What if a big chunk of the new field hadn’t been completely unusable? What if I’d been able to get more rotations into each row, as originally planned? Could we really have grossed over $20,000 on a half acre? The other questions for the next season will be: what crops should I stop growing (onions?) or which ones do I just want to get better at growing (potatoes?). Which ones don’t sell well enough to justify planting (mustard?)? Would I plant the bonus crops as regular crops (definite yes to Husk Cherries)? Charts like this help me start to figure it out. Next, I’m going to work on a chart that gives the sales/foot and sales/plant, which can be helpful in figuring out what crops are worth the trouble. At the wash stand, at the end of the season. Photo by Omar Robinson. This growing season started out terribly. Our garlic was plagued by garlic bloat nematode (very bad news). And the weather just wouldn’t cooperate–we saw an early hot spell, followed by a LOT of rain (more than a foot of rain in one week at the end of June/early July). Our fields just wouldn’t drain, especially our newer field–which suffered from compaction issues from a few years of poor soil management. Our early crops either rotted in the field or just failed to grow. And then it got super hot again in July, with something like ten straight days of temps over 90–bad news for all kind of crops. I was pretty sure we were going to lose money, since we lost our early beans, onions, lettuce, our peppers barely grew, the potatoes were sweltering. It seemed pretty bleak. The main question was: how much will we lose? And then the end of the summer and fall were just about perfect. Very little rain. And warm enough that I was harvesting tomatoes into the third week of October. We did just fine. In May/June, we’d projected gross sales of $15,398, with profits of $2,640. Our final total was $15,814 in gross sales, with $4,200 in profit (approximately–sales are over, but we’re still spending a little money). To get those sales took about 900 hours of my time, plus I drove 7,777 miles for farm work this season (which is one reason why our profit is so low–at the IRS rate of 55.5 cents/mile, we spent $4,300 on mileage/car costs). Husk Cherries: $450. From 20 plants. These were definitely our MVP (most valuable plant), yielding more than $22/plant. These weren’t even in my crop plan! These numbers are a little crazy, if you realize that kale and tomatoes accounted for 52% of our total sales. 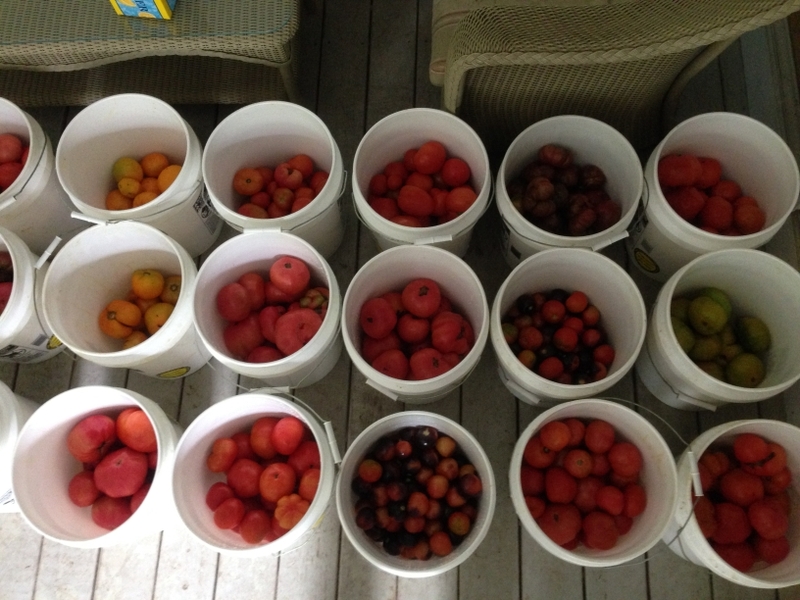 We grew 27 different crops (and tons of varieties), but most of our income was generated by just a handful of them. Last year, we had sales of $7,600 and a loss of $2,440, on a quarter acre (we grew about 3,000 lbs of veggies). So this year, on not quite double the land, we doubled our gross sales, and increased profits by $6,600. And the time I spent on the farm–last year I spent 734 hours, this year it was 900. So, 20% more time, for double the land and sales. In other words, it kind of looks like I’m getting better at this farm thing. I got more efficient with my time and did a better job of growing and selling high value crops. 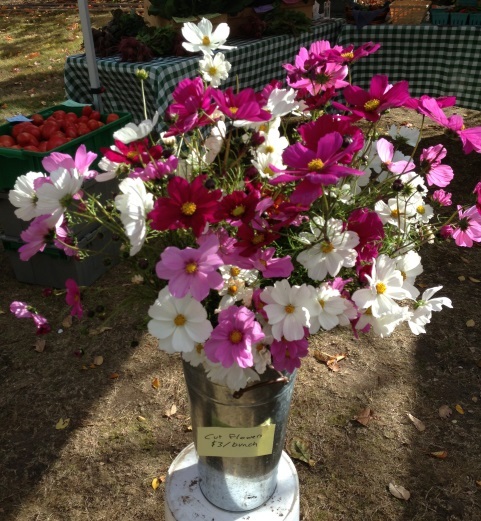 Our weekly farm stand sales rose by about 80%. I’m not sure. A bunch of our plans are up in the air. We’re definitely not returning to the New Entry site–it’s just too far to drive. We can’t afford to spend half our profits on mileage costs. There’s a decent chance we’ll take the next season off, while we try to figure out a way to farm closer to home. I really like the half-acre scale. We’ll just have to see. The one thing I do know is that I’m really hooked on the challenge of farming. It continues to be fully engaging–physically, mentally, and spiritually. next up: a detailed crop report, plus posts on my Lessons of a Second Year Farmer. It’s the end of season #2 for Pen and Pepper Farm. The field is put to bed, ready to be harrowed and planted with a cover crop for the winter. I’m sad to say goodbye to our fields at New Entry in Dracut, and don’t know exactly when and where Pen and Pepper will return to farm. I want to say thanks to Tracy and Noah for working so hard with me. To Kevin Manuel, for helping me plant seedlings in the spring. To New Entry for giving us space to farm and incredible support, especially Eero and Guy for teaching me so much this season. To all my fellow incubator farmers, for their help and good humor in what was a very difficult season. I thank World Peas and Kate for giving us a great market and stability. And to Sophie, Leah, Hallie, and Andrea at the JP Market for making it fun. And to our regular customers, whose appreciation of our produce made it all seem worthwhile, especially Jonas, Peter, David. To Charles and the Huntington Theatre Company for their support at our mini-market. 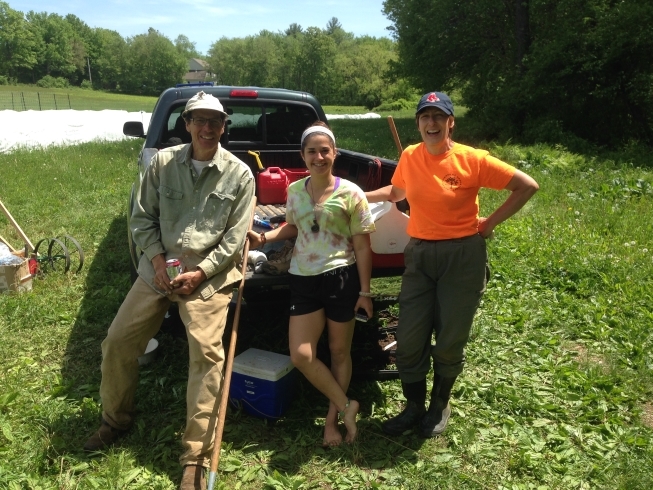 And especially to our friends who were there for our mini-CSA experiment: Amy Spalletta, Dan Milstein, Bonnie, Walt McGough and Annie Cardi, Roberta, Angela, Erica, Kevin, and Charles and Josh. And to our neighbors who would stop by our house to buy tomatoes. We couldn’t have done it without all of you. Soon, I’ll have time to get into the spreasheets and put up a series of blog posts about how our season went (we made money!) and what we learned (lots). We gave a tour of the farm as part of the New Entry open house in late July, but I thought it’d be fun to give you all a quick video tour of the farm, so you can see how things are laid out and what we’re growing. Time on the farm is super busy right now, with most of our activity finally shifting from weeding to harvesting. The tomatoes are coming in strong, which is very exciting. So, take a look at our farm. And if you’re around, come say Hi at the farmer’s market in Jamaica Plain on Thursdays, 12 South Street, from 2-8pm. We’ll be there until the end of October.